Whether you are looking for adventure, nature, romance, surfing, fishing, or any number of other activities, Costa Rica has plenty to offer you. Indulge in hot springs in front of active volcanoes, soar through the canopy of the cloud forest on a zipline adventure, observe sea turtles nesting, go whitewater rafting on world class rivers, spot Toucans or Scarlett Macaws, drift away on romantic sunset cruise, golf professionally designed courses, dive reefs off of tropical islands. As you can see, the options are plentiful. 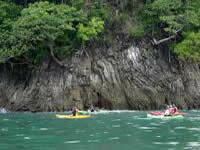 Click on the links to see what Costa Rica activities are available from your destinations. This page will get you started with a whirlwind tour of activities available across the country. Whether you are going sport fishing off the coast of the Osa Peninsula, birdwatching in the Monteverde Cloud Forest or soaking in the hot springs below Arenal Volcano, this page covers it all. Click on the link to learn more about the many activities available in Costa Rica. Look no further if you are seeking thrilling adventure! Costa Rica is an eco-tourist paradise with seemingly unlimited adventures. Visitors can raft raging rivers through the rainforest, soar through the trees of the cloud forest on a canopy zipline or rappel down jungle waterfalls. This really is the only tip of the iceberg for adventure activities. 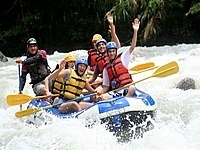 Click on the link to learn more about Costa Rica adventure. Located on an isthmus between South and North America, Costa Rica is a ecological melting pot with incredible biodiversity. There is an astounding 250 mammal species, 800+ species of birds, 400+ species of amphibians and reptiles and literally thousands of plant and tree species. Click on the link to learn more about Costa Rica wildlife observation. 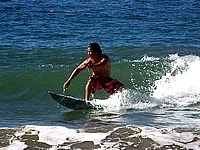 There is no shortage of great surfing in Costa Rica as there are fantastic surfing beaches on both coasts. Whether you are going to Puerto Viejo for a wild ride in the southern Caribbean or Tamarindo to learn how to surf on the Pacific, you will have an awesome time surfing in Costa Rica. Click on the link to learn more about Costa Rica surfing opportunities across the country. The mountainous terrain of Costa Rica creates some pretty amazing hiking opportunities. Cerro Chirripo is a favorite peak to hike as it is the tallest in Central America. 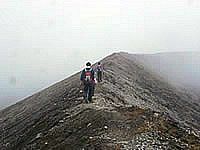 Visit Rincon de la Vieja, Turrialba or Irazu to hike to the crater of a volcano. Hike through the canopy of the rainforest on hanging bridge tour. There are many hiking options to choose from in nearly every corner of the country. Click on the link to read more about hiking in Costa Rica. The beaches of Costa Rica are nesting areas for four species of sea turtles; Leatherback, Green, Olive Ridley and Loggerhead. These turtles have utilized the beaches of Costa Rica for nesting for millions of years. The country has exceptional protection programs and has become one of the only places in the world with rebounding populations of these fascinating reptiles. 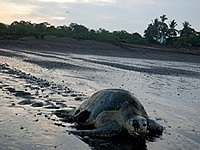 Click on the link to read more about Costa Rica turtle nesting. 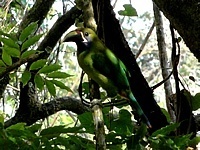 Costa Rica simply put is a birdwatching paradise. The varied ecosystems and dramatic elevation changes create thousands of small micro climates, which provide habitat for a wide variety of bird species. Waterfowl can be observed along the shores and then highland species such as quetzals can be observe in as little as a two drive away. Click on the link to read more about Costa Rica birdwatching. Costa Rica really is not known as one of the best destinations for scuba diving, but there are some good sites here nonetheless. Better diving can be found at Cano Island or Catalinas Island on the Pacific where one has the opportunity to see sharks, rays, sea turtles and more. The best diving can be found on the Caribbean side with diving just minutes off shore. 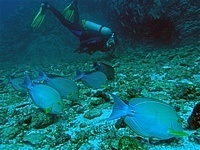 Click on the link to learn more about Costa Rica scuba diving. While Costa Rica is better known for eco-tourism, it is home to some really great golf courses. Some of these courses are considered to be championship quality courses. 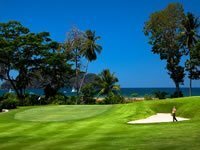 Click on the link to read more about Costa Rica golfing.